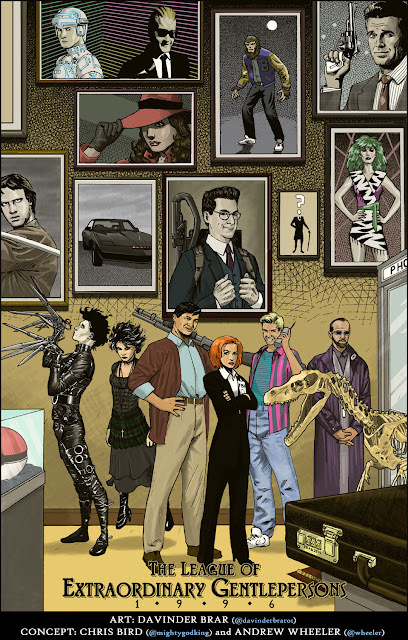 I love the idea that the League of Extraordinary Gentlemen continues on throughout history, taking on different pop culture characters over the decades. Davinder Brar, Chris Bird and Andrew Wheeler, have created the '90s version, consisting of Edward Scissorhands, Nancy Downs (The Craft), Tequila Yuen (Hard Boiled), Dana Scully (The X-Files), Zack Morris (Saved by the Bell) and Rufus (the Bill & Ted's Excellent Adventure). Far more plot details at MightyGodKing and a listing of the League members on the wall at Comics Alliance.